It’s “Susie Forest” T-shirt time again. I wore my terra cotta one Thursday to the end of semester festivities for the Cheney home schoolers. 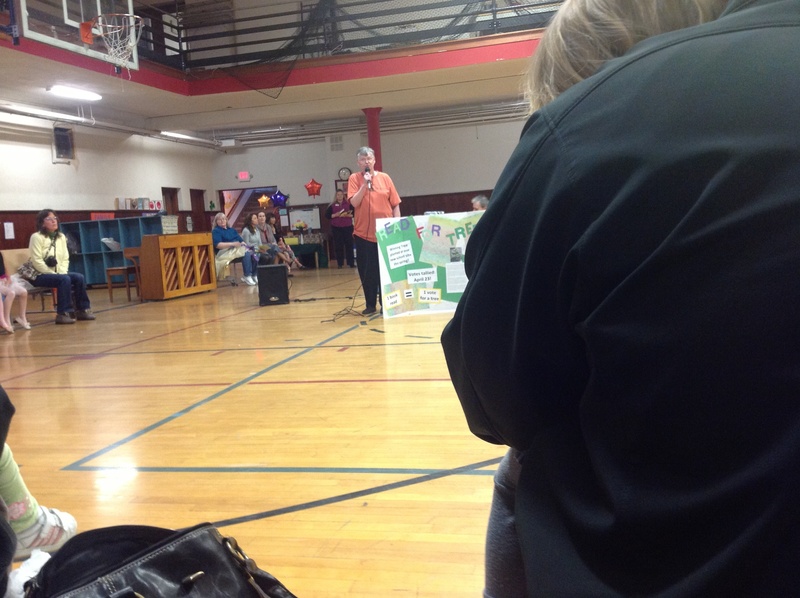 My kickoff of the Read for Trees program was the kickoff of the evening’s entertainment. And I entertained them by dropping things as I tried to juggle my pictures and my tree-gram and my microphone. I hope the students are excited and will read lots of books. Chris Purviance, the parent I’m working with did a beautiful display board. 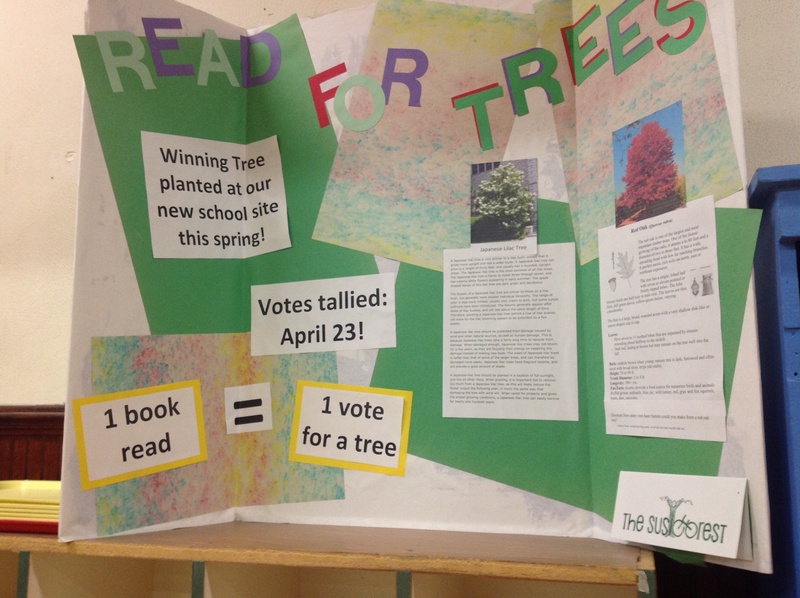 So now they have my tree stump, their ballots, thermometers to keep track of the reading and lots of Susie bookmarks. Let the contest between the red oak and the Japanese lilac tree begin! I was followed by the “real” entertainment. It began with three little dancers in pink tutus, followed by three older (by a bit) girls with sparkly cell phones. The last we saw before left were five singers in plastic derbies. As we were leaving a woman came up to me and asked if I would meet with her Girl Scout troop and tell them about the Susie Forest. Of course. Maybe there will be more girls with Susie Forest patches on their sashes. A great evening! Resolution #10 – Find ways to use the Susie Forest logo. How shall I accomplish this one? I can’t afford a billboard or a sign on a bus. Maybe I could put the logo on pens and “forget” them all over town. That’s one idea. HERE’S A GOOD ONE! I could wear one of my Susie Forest T-shirts whenever I’m out where people might notice it. So on Monday morning I wore it to a City Council briefing meeting at City Hall. Did anyone notice? I don’t know. Today I wore one while I volunteered at the Library bookstore. I decided I would give a Susie bookmark to anyone who mentioned my shirt. No takers. But I’ll keep on and see what happens. Tomorrow is the first Susie tree of the year in Spokane. A hard day but a good day.